Tyger Tyger burning bright! Make it past the teeth, and you’ll be all right! We recommend reading Beware of Tigers by Dave Horowitz (G.P. Putnam’s Sons, 2006). Feathered friends Chirp and Birp are laughingly incredulous that a tiger is in their city, despite warnings from others. Well, there IS a tiger, and he is more than happy to entertain two tasty little birds. As his smile grows wider and wider, Chirp and Birp realize that perhaps cuddling up with a tiger isn’t such a great idea. Good thing they have a friend with even bigger teeth! This project is a modification of a Valentine’s box I pinned and swore I would find a use for. Yes! Begin by covering a large tissue box with orange construction paper. 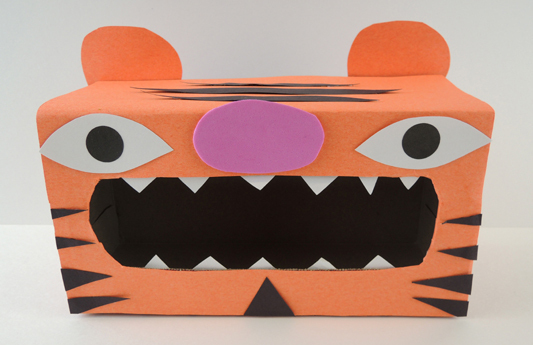 Next, use more construction paper to add a nose, eyes, and stripes (or draw them on with markers). The teeth are construction paper too. To play the game, place several objects in the tiger’s mouth. 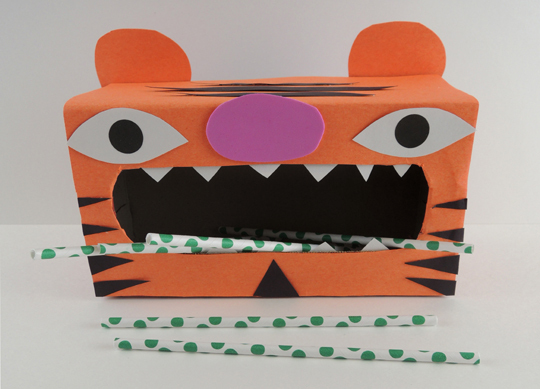 Then challenge kids to gently reach in, and – without moving, tapping, or knocking over the tiger – remove the objects. The objects can be anything. For younger kids, it might be best to use something that stick out past the mouth like drinking straws. For older kids, smaller objects like jingle bells, foam beads, or pom-poms work! Believe it or not, we have more chomping creature projects on the blog. Check out our cookie-consuming cow here, and our monster food chain here. Need some dental assistance? We have your crocodile care kit right here. This entry was posted in Simple Projects and tagged activity, art, Beware of Tigers, challenge, children, craft, craft project, Dave Horowitz, dexterity, easy, game, how to, instructions, kids, literacy, motor skills, story time, story time project, storytime, tiger by Dana Sheridan. Bookmark the permalink.